Alex Belth: With all due respect to George Plimpton’s bona fides as an observer—and participant—in the sports scene for many years, his “small ball” theory, which is the jumping point for your Introduction, comes across like cocktail party wisdom. It sounds good but crumbles under closer investigation. Then again, that doesn’t matter because the idea stuck. Basketball doesn’t have the reputation as a literary sport in the way boxing or baseball do, and it doesn’t have the burdens, either. Can you talk about how that shaped your approach to this collection? Alex Wolff: I’ll admit that Plimpton’s slight regard for basketball writing was a helpful foil to have. And I’ll also admit that there was a kernel of truth to his theory. He advanced it in 1992, and he targeted his critique at books. In fact magazines, not books, delivered most of the best stuff to be found pre-’92, whether it was The New Yorker, which published Herbert Warren Wind on Bob Cousy and John McPhee on Bill Bradley, or Sport, which gave us Jimmy Breslin on Al McGuire and Peter Goldman on the unknown but fascinating Globetrotter Leon Hillard. And there ought to be a plaque down at West Fourth Street honoring Harper’s for commissioning the original reporting that led to two classic playground books, Pete Axthelm’s The City Game (which Plimpton did nod at) and Darcy Frey’s The Last Shot (which came out post-Small Ball Theory). As someone who has devoted his professional life to writing about basketball, I’d long carried Plimpton’s assessment around like an undressed wound. But my instinct told me his judgment wasn’t true once you account for the quarter-century since. 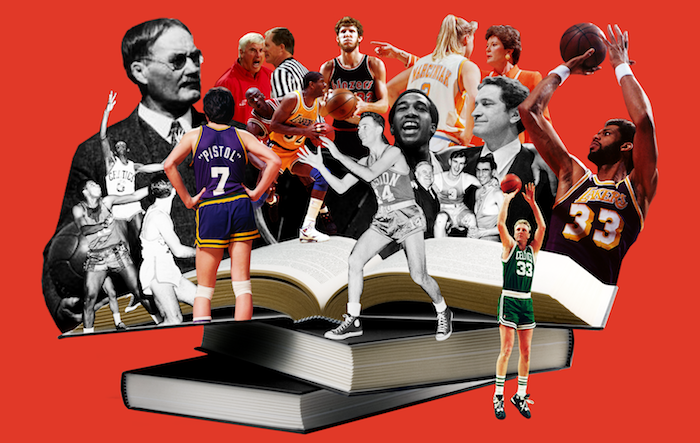 Plimpton had his biases and social milieu: Basketball is the most prominent sport he never treated with one of his participatory books, and even past the ‘60s the hoops world wasn’t the place patricians like him would hang. Books, and what’s “literary,” have upper-class associations. Wealth and leisure and literature go hand in hand in hand, and where they meet you’ll find golf and tennis and, because of its slow pace, baseball—witness that whole John Updike-Ted Williams thing. But because basketball is comparatively downmarket, it’s much more universal, which meant we had a banquet table of voices, subjects, and genres to choose from. But I will say that Plimpton’s observation had value as a clarifying marker. While there might have been some truth to it in ‘92, writers of books from Frey to Pat Conroy to John Edgar Wideman to George Dohrmann have since obliterated and mocked the theory. Tellingly, in their signature basketball books all four of those writers looked at the game in idiosyncratic ways or out of the way places. Basketball writing got big, and better, when writers took their heads out of the play-by-play and pulled in the adjacencies—race, gender, labor relations, society at large. Or looked deep within themselves. AB: Unlike boxing and baseball, there isn’t as much written about basketball in the first half of the 20th century. How did you go about mining the older material? Wolff: There’s a reason the canon is backloaded. Pro basketball was small-time and bush league for decades, just another way for hockey owners to book dates for their arenas. College ball amounted to little more than regional clusters of interest until the tournament blew up after the UCLA dynasty. So props to the librarians, archivists, and curators who threw open collections and fielded my queries. Because the early stuff was so much harder to find, it feels even better to have it in the book. Without Basketball: Its Origins and Development by James Naismith, there’s no FreeDarko. AB: There are certain Hall of Fame touchstone pieces you have to include—something from McPhee on Bradley, Axthelm’s The City Game, Telander’s Heaven is a Playground, Halberstam’s Breaks of the Game—and certain writers you have to include—Deford, Pierce, Kirkpatrick, Reilly, McCallum, Wideman. Did you have specific stories for those bylines or did you just know you wanted to get one piece by them? We did want to make sure the full span of the game’s history was represented, and include a sampling of profiles of great players and coaches, and the many ways peculiar to basketball that the sport presents itself, from clowning to analytics. Where we could have a Kareem Abdul-Jabbar or a Bill Russell actually author the piece or excerpt, so much the better. In the end, the tiebreaker was, Okay, how does this hold up once you account for the writing, the subject, and the overall mix we’re striving for? We could say, “Hey, six-to-a-side girls basketball in mid-century Iowa is quintessential Americana and needs to be in the book.” But if we didn’t have Douglas Bauer’s “Girls Win, Boys Lose,” which is so personally and novelistically rendered, we weren’t going to go through contortions to find a place for that little slice of the basketball pie. AB: At the same time, were there certain personalities you knew you had to include—Kareem, Bird, Pat Summit? Or events? Wolff: A basketball anthology with nothing about Michael Jordan in it would have a hole at its heart. We were lucky to be able to include two selections that got at him from an angle: a Rick Reilly road piece that captures the winding down of the Bulls’ dynasty, and Jack McCallum’s account of the greatest game nobody saw, the Dream Team intrasquad scrimmage where Michael and Magic went at each other. Same with Kareem: Yes, we have David Bradley’s Esquire profile from the end of his career. But revealing in a different way is Kareem’s own account of the Apache kids in Arizona he winds up coaching in retirement. So in a few cases we went Rashomon, providing more than one way into the same personality, if that personality was big or interesting enough. I’m curious how you went about picking a piece from both a guy like John Edgar Wideman, a novelist who has written extensive non-fiction about hoops, Gary Smith, who wrote so many good hoops-related stories, and then beat guys like Curry Kirkpatrick and Jack McCallum. Wolff: For the Wideman excerpt, all credit to Jim Gibbons, the Library of America editor I worked with who also midwifed collections on baseball, boxing, and football. He recognized the integrity of a passage about Wideman’s Pittsburgh encounters with NBA old-timer Ed Fleming. Jim also zeroed in on the chapter from Pat Conroy’s memoir that we wound up using, which is really a sugared-down version of the entirety of My Losing Season. As for writers like Gary and Curry and Jack, there’s so much of theirs to choose from that part of our consideration could be, Okay, what subjects would the larger book really benefit from having covered? And the greatest women’s coach of all time, the Final Four, and the Dream Team all fit into the overall scheme. AB: I so enjoyed your author bios. That is a very specific form of writing compression. Being a longtime magazine guy must have helped! Did you do reporting for them? Wolff: Selfishly, I wanted to know the genesis of some of these pieces and the techniques writers used. So yes, I fired off emails and picked up the phone and scoured the web for old interviews with the contributors. It was fascinating to learn why Gary Smith used a particular “camera set-up” technique in his Pat Summitt profile, and that Stanley Cohen offered to return the advance he got for The Game They Played, and that half of Donald Hall’s poet friends can’t understand why he writes about sports and the other half envy him that he does. As a rule of thumb, I wanted to make the first half of each headnote biographical and the rest a set-up for the selection to come. What I love about each of the first three Library of America sports collections—baseball, football and boxing had already been done—is how, if you just read the introduction and the headnotes, each book doubles as a history of that subgenre of sportswriting. That’s what I was striving for. AB: If there is any subset of hoops literature that could comprise a book of its own it’s street ball. Can you talk about the depth of material on that part of the game, and how difficult it was to narrow your choices. Wolff: At first I was a little concerned that we would be featuring three playground pieces all set in New York City—Axthelm, Telander and Frey. But the more I burrowed into them, the more I realized that each took a sufficiently different tack. And Melissa King’s journal of being a white Southern woman on the courts of inner-city Chicago set the outer boundary of this subgenre. For all the variety in the book, it’s nice to have a handful of pieces with a common reference point. Having played the game, even just in the driveway, is something most people who pick up the collection will be able to relate to, in a way they couldn’t with, say, boxing. His childhood driveway is staging ground for Bryan Curtis’s reminiscence about the therapeutic value of a fiberglass backboard, and the piece works so well in part because shooting hoops in the driveway is familiar to so many people. I love how you include some out-of-the box choices, like Tom Meschery’s journal, or the piece by Rowan Ricardo Phillips. How did you go about casting such a wide net? Wolff: Of all the sports that Library of American has done, basketball has had the liveliest presence on the web. To be able to choose from sites like Grantland and Phillips’s home at the website of The Paris Review—the George Plimpton-founded Paris Review, no less!—and even FreeDarko made for some fun discoveries. At the other end of the timeline, in the libraries of the Hall of Fame in Springfield and Richard Johnson, the curator of The Sports Museum in Boston, I found old copies of Best Sports Stories, which included Red Smith on Rhode Island’s Ernie Calverley and Edith Roberts on the Indiana high school that inspired Hoosiers, as well as that Meschery diary of a season as an ABA coach. Massachusetts was very good to this book. But friends and colleagues who heard what I was up to supplied some great steers too. Wolff: Writers I’d never read before, and I’m so glad we found, include Phillips, a decorated poet who has such a quirky and fresh take on the NBA. We feature a bunch of poets, who for some reason are drawn to basketball; as Rus Bradburd says, poetry is cross-training for essay writing. An old SI colleague, Bruce Anderson, knew the stuff of the late Brian Doyle from the world of university magazines, where they’d both worked, and he shared with me a prize-winning memoir Brian wrote about watching a pickup game with his dying brother, which first ran in Notre Dame’s alumni magazine and is so beautifully wrought and universally true. Then there’s the voice of Peter Goldman, which many of us know because for years it filled up the front of the book at Newsweek—only in that anonymous, newsmagazine-y way, so the byline probably doesn’t register. But his profile of Leon Hillard is evocative and empathetic and gritty and knowing, with the kind of narrative surefootedness those of us who write for magazines all aspire to. AB: I was excited to see a bit from Bill Russell’s memoir with Taylor Branch. (I love the story about the mule.) What are the other hoops memoirs that you like? And also, what’s on your short list of favorite hoops biographies? Wolff: To drive home the point that we couldn’t come remotely close to including everything we wanted to, let me confine myself to what isn’t represented in the book. I love Charley Rosen’s Players and Pretenders, an account of a season he spent coaching at hippie-dippy Bard College. I also love Bradburd’s Paddy on the Hardwood, about fiddling and losing and ultimately winning in Ireland. And the essay by the aforementioned Brian Doyle is one of 95 in his collection Hoop. As for bios, among my favorites are Foul!, David Wolf’s cri de coeur on behalf of Connie Hawkins, and Andrew Maraniss’s Strong Inside, on Perry Wallace. There’s also Mark Kriegel’s fine Maravich study. As it happens, we included a brief but spot-on obituary for Pistol Pete by Dave Kindred. AB: For me, one of the best revelations is Herbert Warren Wind. I was not familiar with him and his piece on Cousy benefitted from the same thing afforded McPhee, and Roger Angell writing about baseball: Space. Can you talk about his contribution to this collection? Wolff: People know Herb Wind mostly for his golf writing and long association with The New Yorker. His writing isn’t exactly a laff-riot, even if—trivia alert!—the comic Bill Scheft is his nephew. He seems like the last guy to have actually played basketball—but he did, really well, at Yale. So when Cousy landed at Holy Cross and then with the Celtics, Herb, a New Englander, took note. And from having played himself, he had a framework in which to slot a truly revolutionary player. His piece is long, but it did heavy lifting for us, not just in portraying one of pro ball’s early stars, but also in conveying a sense of life in the old NBA and bridging the mid-’50s to the mid-’60s. For the sake of shining some light on a force whose reputation has faded over the course of time, can you talk a little about George Kiseda, who came out of the Philly Daily News sports department in the Larry Merchant era—which was one of the powerhouse sports departments of all time. Going into a project like this, you think you know where you’re going, but surely there are many more “unknowns” than “knowns.” What about the collection do you hope will delight readers? Wolff: Basketball is such a personal game, one you can play all by yourself. So it shouldn’t have surprised me to find so many rich pieces with a personal touch. But I think those are the ones that will stick with readers, whether it’s Bauer on what it’s like to be the end-of-the-bencher on the boys’ team who’s dating the star of the girls’ team (“How great it would be to be so good that a bad night was the reason one’s team had lost”). Or James McKean’s bluntly honest memoir of what it was like to play for Jud Heathcote, a guy half his size and twice his age and 10 times as irascible. Or Bill Russell confessing that sometimes the flow of a game got so transcendently good that he secretly stopped caring whether the Celtics won. Or those essays by Curtis and Doyle, which both deal with what death leaves behind. But that’s hoop. You never hear a first baseman or a lineman talk about the ins and outs and peculiarities of “my game.” It was getting to look through windows into so many writers that made the collection so much fun to put together.